The website of National Geographic has published just today an article about how an historian of Gothic art and architecture, Vassar College’s Professor Andrew Tallon, is applying laser technology to the study of some of the great Gothic cathedrals. It includes a video with an nice explanation of how lasers are used to make extremely precise measurements of the building, and some surprising results of the research. 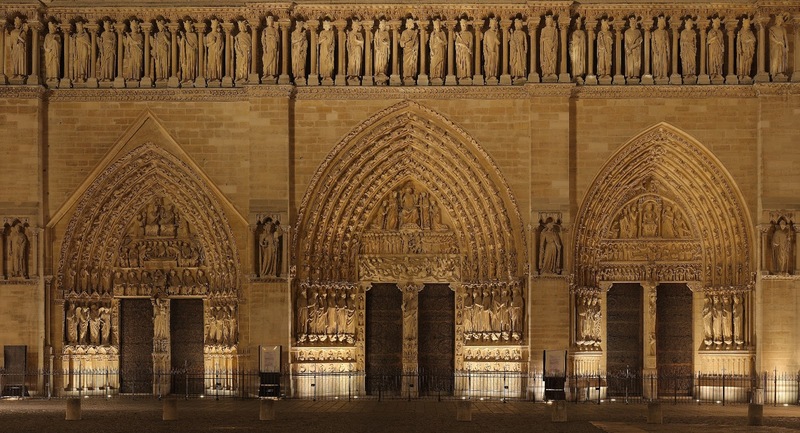 The video is most focused on the National Cathedral in Washington D.C., but the article talks about some of the great Gothic cathedrals like Notre Dame in Paris and the cathedral of Laon. Thirteen million people visit the Notre Dame Cathedral in Paris every year, entering through massive wooden doors at the base of towers as solidly planted as mountains. They stand in front of walls filigreed with stained glass and gaze at a ceiling supported by delicate ribs of stone. If its beauty and magnificence is instantly apparent, so much about Notre Dame is not. The laser scans have led to surprising new information about Notre Dame’s builders. For one thing, they sometimes took shortcuts. Even though medieval builders strove to create perfect dwelling places for the spirit of God, Tallon’s scans reveal that the western end of the cathedral is “a total mess ... a train wreck.” The interior columns don’t line up and neither do some of the aisles. Rather than removing the remains of existing structures from the site, the workers appear to have built around them. That cost cutting could have been catastrophic. Based on stylistic changes, scholars have long suspected that work on the western facade stopped for a while before the towers could be built. When Tallon scanned it, he discovered why. The Gallery of Kings—the line of statues above the three massive doorways—was almost a foot (.3 meters) out of plumb. Tallon concluded that the western facade, built on unstable soil, began leaning forward and to the north. Construction had to be halted until the builders could be confident that the ground had compressed enough to resume. After an anxious decade or so, it had. 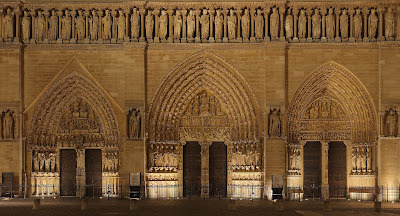 The portals of the west façade of Notre-Dame-de-Paris, with the Gallery of Kings above. Image from wikipedia by Benh Lieu Song.